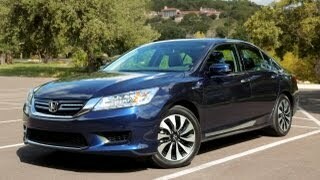 Honda has unveiled the 2014 Accord Hybrid, which will offer ultra-high fuel economy and a completely new driving feel. 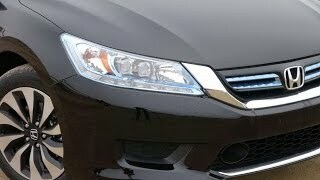 The all-new Accord Hybrid features Sport Hybrid i-MMD (intelligent Multi-Mode Drive), a revolutionary Honda-developed powertrain. 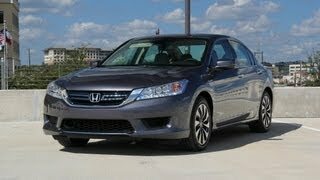 The Accord Hybrid offers refined driving worthy of a premium sedan and ultra-high fuel economy of 30.0 km/L. The styling reflects the formal dignity of a sedan, while inward curvature toward the front and rear helps control airflow along the sides of the vehicle. The result is outstanding aerodynamic performance that contributes to ultra-high fuel economy. The V layout of the front and rear seats enhances the interior, offering the rear occupants a pleasant field of view. The driver has easy access to the information-rich meter array. The interior is a comfortable and pleasant place to be.